The Pharmacy Technician is 14-week program with a total of 442 program hours. The program trains students to prepare them for employment in a pharmacy, hospital, and health care agencies. Students will gain the knowledge of pharmacology, side effects, pharmacy math and dosage calculation, drug preparation, packaging, and distribution as well as the function and services of the pharmacy. This program is approved by the Arizona State Board for Private Postsecondary Education. 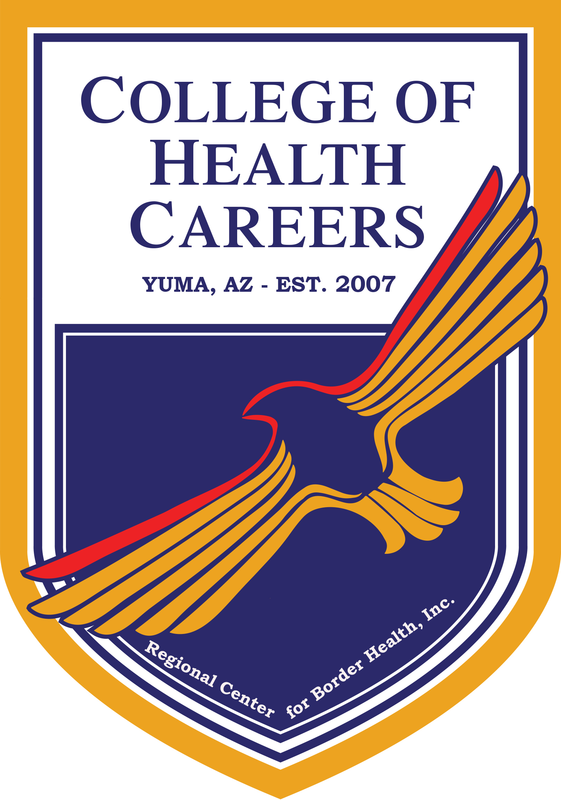 Additional documentation may be requested to clarify or verify information provided by applicants for admission to Regional Center for Border Health, Inc./College of Health Careers. Students will test for the Pharmacy Technician Certified Board (PTCB). A total of 442 Clock hours which includes 222 lecture, 60 laboratory, and 160 externship hours. Students will be provided an overall orientation of Regional Center for Border Health, Inc., and complete required student file forms. During this orientation, students will be provided a short Medical Terminology course with an evaluation at the end of the course to measure understanding. Students will be taught how to “break down” medical terms using prefixes, root words and suffixes to promote a basic understanding of the terminology used in the medical field. Orientation to the computer lab and online medical library PubMed will be provided. Pharmacy is an old and intriguing profession that was once filled with mystery and unknown methods. These have evolved into the art and science of preparing, preserving, compounding and dispensing medications. The field of pharmacy is as old as mankind, yet as new as present day medicines. The history of pharmacy is important because its evolution parallels the evolution of mankind. Professionals have a knowledge base that others do not possess, but others do need these services. Therefore, professionals have certain social and societal obligations to apply their knowledge for the good of the community they work in. Pharmacy technicians must be familiar with the legal requirements that relate to their daily professional activities. The laws relevant to the practice of pharmacy may come from different sources, such as the FDA, DEA or the state board of pharmacy. Knowledge and differentiation between civil, criminal and administrative law is important to the practice of pharmacy. So too, is the knowledge of ethics as it is applied to the field of pharmacy. Ethics is the study of values or principles governing personal relationships. These values and principles are used to determine whether actions are right or wrong. By being aware of our own sense of right and wrong, we can gain a better understanding of the ethics as they are applied in the practice of pharmacy. Medications have the potential to cause serious harm to the patient. Therefore, the process of dispensing and administering medication orders must always be performed with great care. Medical terminology is the language of medicine that is used in all areas of the health care industry. Knowledge of medical terminology is required for the pharmacy technician. Understanding how medical terminology developed, helps the student understand the words commonly used in medicine & pharmacy practice. To assist the pharmacy professional, a study of the human body anatomy & physiology is required. During this study, students learn the structure, physiology and common disorders associated with these body systems and how these disorders are caused – either genetically or by a pathogenic organism. Knowing the causes of the disorder, pharmacology studies the origin, nature, chemistry and uses of drugs to treat disorders. Physician drug orders may be obtained in a variety of ways, written, electronic or verbally. Processing prescriptions within the hospital, community and long term care pharmacies is compared along with other types of prescription processing patterns. Mathematics in the pharmacy setting is universally recognized as an integral part of the practice of dispensing medications in relationship to patient safety. As such it requires for students to recognize, learn & apply basic mathematic skills. In this section advanced calculations are utilized to ensure the patient is receiving the correct dosage, as ordered by the physician. Educational opportunities exist for not only the patient, but also for other healthcare workers. Utilizing the skills obtained in this course, the student is better prepared to recognize, apply simple or complex formulas to ensure patient safety & use these same skills in the patient/healthcare worker educational process. Mathematics is also involved in more than just dispensing medications. Businesses utilize common calculations in inventory control, financial balances, estimating future costs and other areas of the financial well-being of the practice. Students will be assigned to a community pharmacy to observe and interact with the pharmacy staff. Regulation of safety practices is utilized to minimize risk of injury. Students will observe and practice these safety rules within the community pharmacy setting. Students receive an initial orientation to pharmacy practices, observe the pharmacist & technicians process medication orders, observe the pharmacy customer service practices and gain an overview of general pharmacy policies. Students will be allowed to perform specific tasks as assigned by the supervising pharmacist. Safety issues are present in any place and common sense precautions need to be taken in the workplace, particularly in the pharmacy. The purpose of environmental protection measures is to minimize the risk of occupational injury by isolating or removing any physical or mechanical health hazard in any workplace. OSHA is tasked with ensuring safe & healthful working conditions for all workers in the USA. In the hospital setting, the practice of pharmacy combines support, product, clinical and educational services to provide all encompassing medical care. Dispensing processes have become much more sophisticated than in the past in response to the need to handle a variety of different types of medication orders. On the other hand community pharmacies are found in a variety of locations such as shopping centers, grocery stores, department stores & medical office buildings. Independent pharmacies may be owned by local pharmacists or by regional & national chains. In this course, students learn how pharmacy practice has changed dramatically over the last several years. Pharmacists are more likely to be employees rather than owners and to work for large organizations, such as hospitals, chain pharmacies and managed care pharmacies, rather than in small, independently owned pharmacies. Documentation of all pharmacy activities is very important and may be different depending upon the type of pharmacy. Pharmacy technicians may be required to assist with may administrative tasks in the pharmacy. Students use hands-on work in a pharmacy environment. Students learn dispensing practices, pharmacy software and workflow within affiliated Community Pharmacies. Proper inventory control systems help to streamline the hectic activities of the pharmacies of today. It ensures that the correct products are stocked to serve the needs of patients and minimizes the total inventory investment. Computershaverevolutionizedtheworldofpharmacy. Computer applications have been developed in both retail pharmacy and segments of hospital pharmacy, which include drug distribution, administration, clinical practice and ambulatory care settings. As a pharmacy technician, communication in diverse practice settings requires the ability to communicate effectively with patients, their caregivers and other health care providers. Mathematics in the pharmacy setting is universally recognized as an integral part of the practice of dispensing medications in relationship to patient safety. As such it required for students to recognize, learn & apply basic mathematic skills. In this section advanced calculations are utilized to ensure the patient is receiving the correct dosage, as ordered by the physician. Educational opportunities exist for not only the patient, but also for healthcare workers. Utilizing the skills obtained in this course, the student is better prepared to recognize, apply simple or complex formulas to ensure patient safety & use these same skills in the patient/healthcare worker educational process. Mathematics is also involved in more than just dispensing medications. Businesses utilize common calculations in inventory control, financial balances, estimating future costs and other areas of the financial well-being of the practice. Students will be assigned to a community pharmacy to observe and interact with the pharmacy staff. Regulation of safety practices is utilized to minimize the risk of injury. Students will observe and practice these safety rules within the community pharmacy setting. Students receive an initial orientation to the pharmacy practices, observe the pharmacist & technicians process medication orders, observe the pharmacy customer service practices and gain an overview of general pharmacy policies. Students will be allowed to perform specific tasks as assigned by the supervising pharmacist. Pharmacy technicians have become a major asset for both pharmacies and pharmacists in the world today. Currently there are two organizations certifying pharmacy technicians: The Pharmacy Technician Certification Board (PTCB) and the Institute for the Certification of Pharmacy Technicians (ICPT). Both organizations are accredited by the National Commission for Certifying Agencies. The text provided has been written to assist a pharmacy technician studying for the PTCB examination and is meant to augment the formalized pharmacy technician training program or on-the-job training, but not replace either. Sample tests are provided that review the minimum competencies covered on the PTCB examination.